With a newly developed neutron tomography technique, an HZB team has mapped for the first time magnetic field lines inside materials at the BER II research reactor. Tensorial neutron tomography promises new insights into superconductors, battery electrodes and other energy-related materials. Measuring magnetic fields inside samples has only been possible indirectly up to now. Magnetic orientations can be scanned with light, X-rays or electrons—but only on the surfaces of materials. Neutrons, on the other hand, penetrate deeply into the sample, and, thanks to their own magnetic orientation, can provide precise information about the magnetic fields inside. So far, however, it has only been possible to approximate the variously aligned magnetic domains using neutrons, but not the vector fields (directions and strengths) of the magnetic fields inside samples. A team led by Dr. Nikolay Kardjilov and Dr. Ingo Manke at the HZB has now developed a new method for measuring the magnetic field lines inside massive, thick samples: For tensorial neutron tomography, they employ spin filters, spin flippers, and spin polarisers that allow only neutrons with mutually aligned spins to penetrate the sample. When these spin-polarised neutrons encounter a magnetic field inside, the field excites the neutron spins to precess, so that the direction of the spin polarisation changes, allowing new conclusions about the field lines encountered. 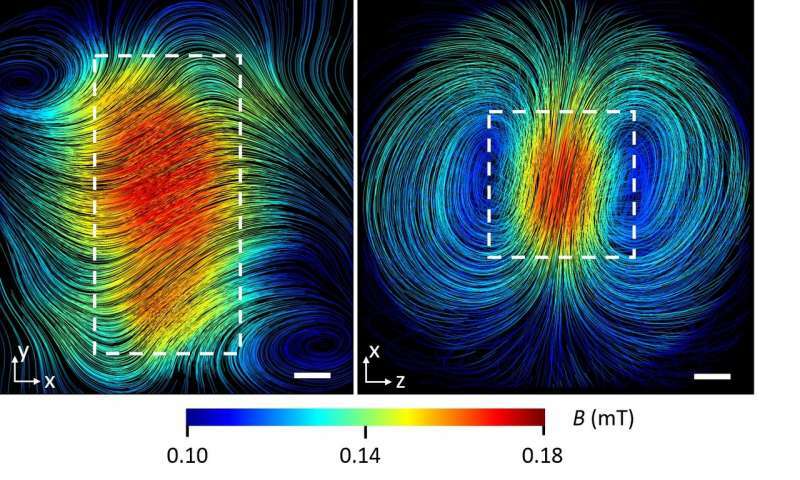 The newly developed experimental method allows the calculation of a three-dimensional image of the magnetic field inside the sample using nine individual tomographic scans, each with a different neutron spin setting. A highly complex mathematical tensor algorithm was developed for this purpose by Dr. André Hilger at the HZB, christened TMART. The experts tested and evaluated the new method on well-understood samples. Subsequently, they were able to map the complex magnetic field inside superconducting lead for the first time. The sample of solid, polycrystalline lead was cooled to 4 degrees Kelvin (lead becomes superconducting below 7 degrees Kelvin) and exposed to a magnetic field of 0.5 millitesla. Although the magnetic field is displaced from the interior of the sample due to the Meissner effect, magnetic flux lines nevertheless remain attached to the (non-superconducting) grain boundaries of the polycrystalline sample. These flux lines do not disappear even after the external field has been switched off, because they have previously induced currents inside the superconducting crystal grains, which now maintain these fields. "For the first time, we can make the magnetic vector field visible in three dimensions in all its complexity within a massive material," says HZB physicist Manke. "Neutrons can simultaneously penetrate massive materials and detect magnetic fields. There is currently no other method that can accomplish this." Magnetic tensor tomography is non-destructive and can achieve resolutions down to the micrometer range. The areas of application are extremely diverse. They range from the mapping of magnetic fields in superconductors and the observation of magnetic phase transitions, to material analysis, which is also of great interest for industry: Field distributions in electric motors and metallic components can be mapped and current flows in batteries, fuel cells, or other propulsion systems can be visualized with this method.